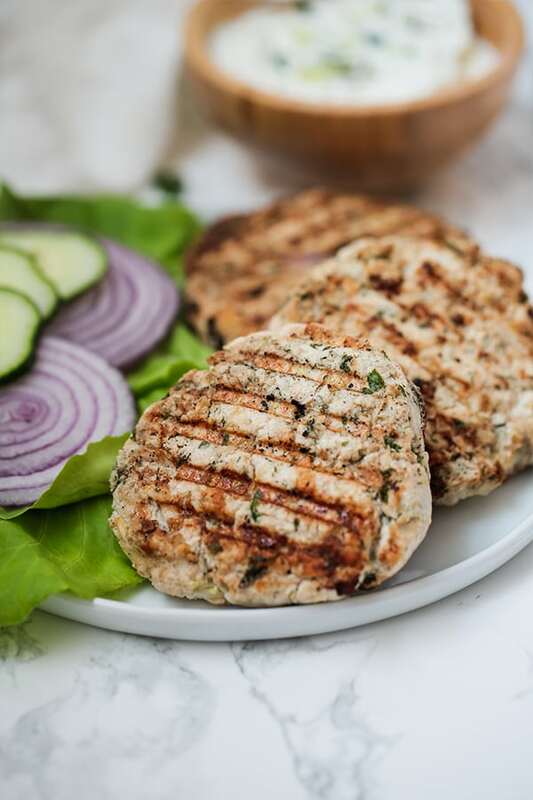 These Greek Chicken Burgers are paleo, whole30, keto, and AIP! 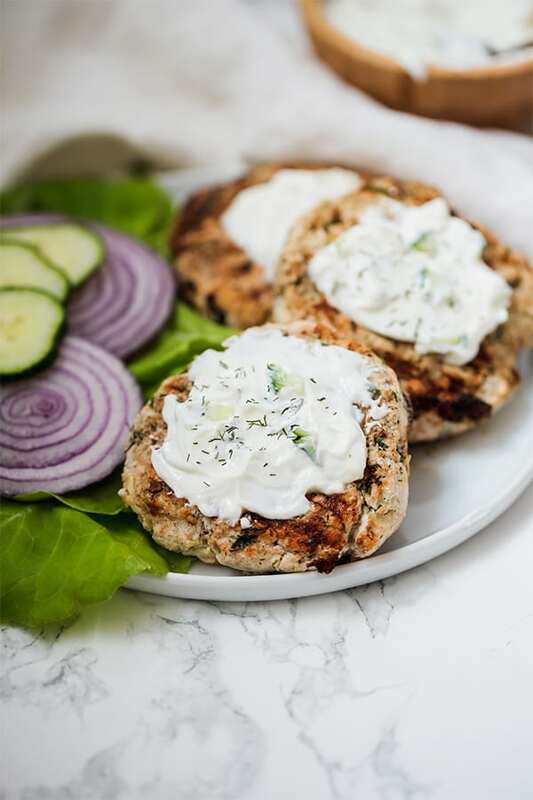 They’re topped with a dairy-free tzatziki and feature traditional Greek-inspired flavors. I’m not of Greek descent, but I’m obsessed with Greek food! Those fresh, Mediterranean flavors are always delicious, and I will never turn down a Greek-inspired dish. Not only does it taste incredible, but they’re really all pretty healthy. Olive oil, fresh herbs, tons of veggies, and delicious proteins like lamb and chicken… sign me up! 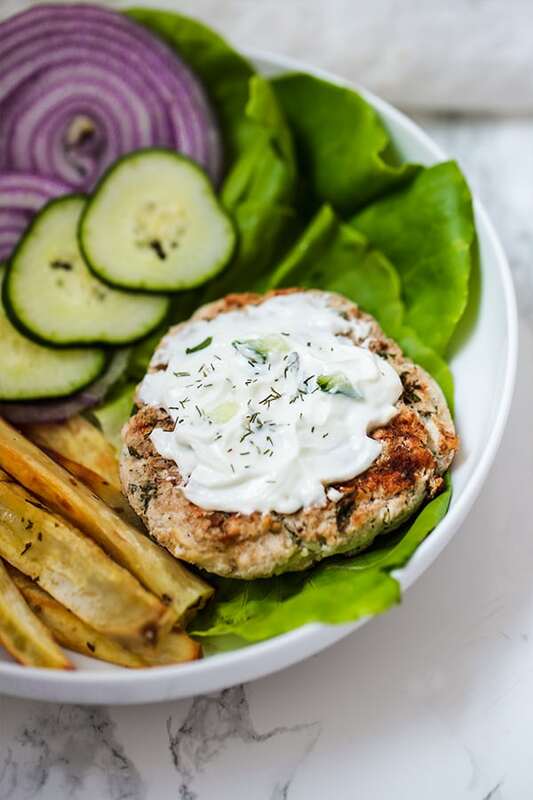 I got a craving for some Greek food recently and decided to try it in burger form with these Greek Chicken Burgers! What makes these burgers special is that they’re free of any flour, eggs, or filler ingredients. They’re paleo, Whole30, AIP, and even great for keto. It’s great as a burger bowl, or in between some butterleaf lettuce as a bun! And what would a greek burger be without a tzatziki sauce? If I only had to choose one sauce to have for the rest of my life, it would be tzatziki. This one is dairy free and is made with coconut yogurt. Of course, if you tolerate dairy you can just go for a Greek yogurt, but this one works best for all diets! If you can’t find ground chicken at the butcher counter, you can also use a food processor to grind your own at home. Or, you can just use turkey! I always have to add hidden veggies to burgers! Zucchini goes great with the greek flavors and has a neutral flavor itself. The zucchini is shredded (you can use a food processor or a grater) and the excess water is removed. This adds a lot of zest and flavor to the burger. This acts as a binder in the burger. Technically, you could use other flours like almond flour if you tolerate nuts, or you could experiment with leaving it out. This is used in both the burger and the tzatziki. This is the tzatziki base. You could use regular greek yogurt if you tolerate dairy. I would recommend the brand co yo for dairy-free or make your own at home. Another hidden veggie inside the tzatziki. Prepare either a grill or a grill pan and set to high heat. Add coconut oil to the grill pan if using. Mix the ground chicken with the seasonings, zucchini, red onion, coconut flour, lemon juice, and coconut oil until well combined. Form the chicken into 4-5 burgers, evenly portioned. Grill the burgers on the grill surface (using extra coconut oil if frying) for about 5 minutes on each side, or until internal temperature reaches 165 F.
Combine all of the ingredients in a bowl and mix well. Add more salt to taste. This was a hit in our household tonight! Delicious!! Thank you! Yay!! Thank you so much Amanda! 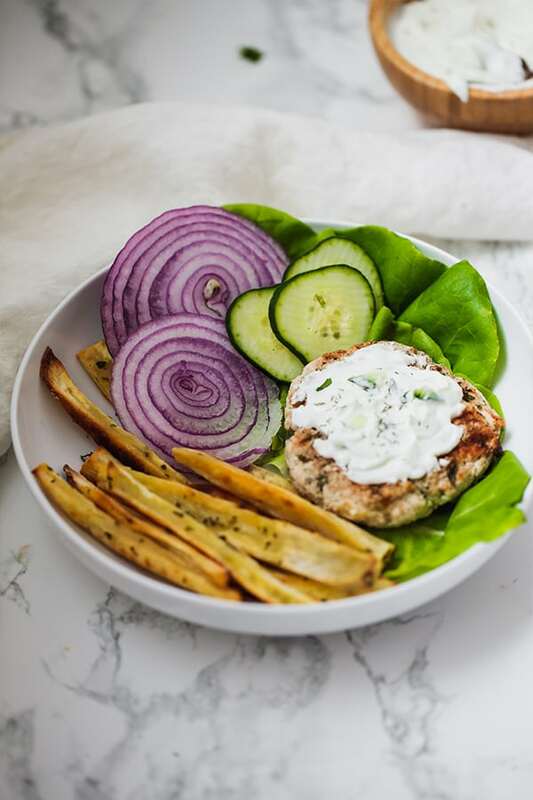 I LOVED the Greek chicken burgers with the tzatziki sauce! I made the chicken mixture into little balls, pan grilled, and put into a wrap I made from cassava flour with the sauce on it. Really satisfied my craving for some Greek food! This is such a good recipe! I used homemade coconut yogurt for the sauce. My dairy-loving husband loved it, too! Thank you! I am excited to make these tonight. Sadly I don’t have any ready made coconut yoghurt but will make some tonight so I can have this on the leftovers this week. I’m still completely obsessed with your Asian poppers! These are so good! I’ve been on a major Greek kick this whole winter season and have been incorporating these, your Greek Lemon Soup, and the Greek One Pan Chicken Meal for the past couple of months weekly or at least biweekly. Oh, and tzatziki on everything! Thank you again for all you do! I want to make it a point this year to rate and comment more recipes I love and your website is definitely one that I repeatedly share with others. You rock!